ÉTICA Y COMPLIANCE: AMORES REÑIDOS. E-book now available for LexisNexis® Guide to FATCA Compliance! 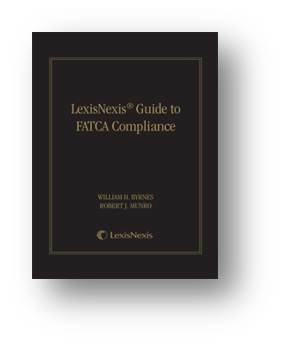 “LexisNexis Guide to FATCA Compliance” has now been released in electronic format. Print orders have already been mailed to Asia, Europe, North America, and the Caribbean. Professor William Byrnes stated, “I built the international tax & financial services graduate program with a mission of facilitating professionals to become excellent communicators of the robust and complex area of international taxation, passing on the legacy of my mentors Walter Diamond, Jacobus (“Joop”) van Hoorn, Marshall Langer and Barry Spitz. “The FATCA Compliance Guide was designed by a list of top industry FATCA experts via numerous interviews and meetings with government and central bank officials, NGO staff, large financial institution compliance officers, investment fund compliance officers, and trust company counsel, and of course, substantial analytic writing. The remaining nations of the world will be covered in quarterly updates scheduled to go live in 2012 and 2013. Because the new product spans so many practice areas, it appears on seven area-of-law pages (Accounting, Banking, Criminal, Foreign Law, International Law, International Trade, and Taxation), plus Lexis Tax Center. Just look under “Search Analysis, Law Reviews & Journals”. This title is also available as an ebook and mobile-book. As of January 1, 2011, the Securities and Exchange Commission will require advisers to make plain-English disclosures to their clients, laying out the adviser’s business practices, conflicts of interest, and the background of the firm and its personnel. The requirement is designed to drag information out of the fine print on client disclosures and present it in easily understandable language. Although innocuous sounding on its face, the requirement will carry a significant cost in time and resources. After reading the analysis, we invite your questions and comments about indexed annuities by posting them below, or by calling the Panel of Experts.